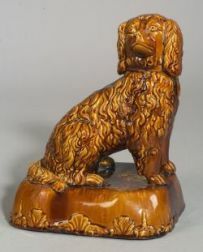 Pair of Staffordshire Spaniels and a Pair of Staffordshire Figural Dog Groups. Staffordshire Blue and White Spaniel Transfer Decorated Covered Sugar. 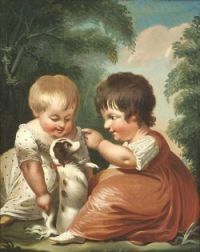 Pair of Miniature Staffordshire Spaniels and Two Miniature Figures. 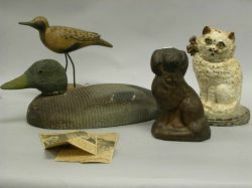 Homer Lawrence Carved and Painted Wooden Shore Bird, Painted Cast Iron Cat and Spaniel Doorstops and a Painted Wooden Duck Decoy. Gilt-Decorated Porcelain Reticulated Basket and a Copper Lustre Staffordshire Spaniel. Pair of Staffordshire Spaniels and a Single Staffordshire Spaniel.